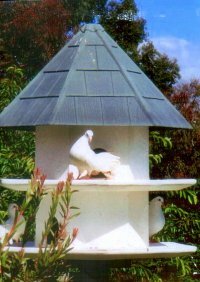 "You dream it, we create it"
The Dovecote was not designed specifically for a client. I wanted to create a home for the birds that complemented the garden. Crafted with a timber appearance and built from tough, lightweight polythene they are made to last a lifetime. The concept had to incorporate elements that made them easy to clean, cat-proof and have feeding areas and bird baths on all levels. The finished product is a beautifully simple and elegant design that is easy to install and looks fantastic in any setting.